Anyway, in Chapter 3 (p81) Shallice and Cooper reproduce the diagram below from Marconi et al. 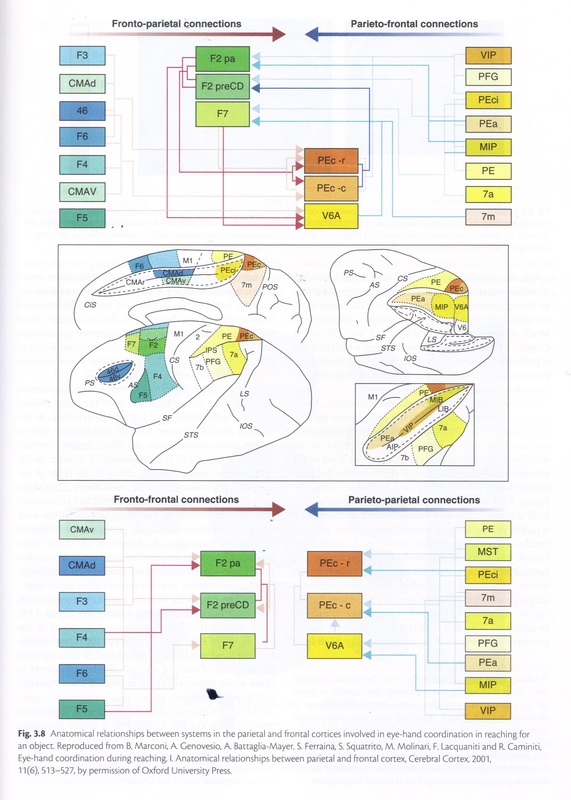 showing the anatomical relationships between systems in the parietal and frontal cortices involved in hand-eye coordination involved in reaching for an object. Note: this is just the systems involved in reaching out for an object. This is not ‘reaching out for an object, feeling the object, experiencing the evocation of memory & imagination and sharing that experience with others’: just reaching out. When I started this project, I don’t think that I could have imagined this degree of complexity and, staring at it, I am quite daunted by what I’ve gotten myself into. Nonetheless, the topic still fascinates me, so I’ll persevere in skipping in the footsteps of serious researchers. Research associate at Newcastle University. Previously a museum educator and researcher. This entry was posted in Cognition, object handling. Bookmark the permalink. Published! An object handling paper. Objects and memories – evoked or invoked?